Learning the times tables is a rite of passage for school children - a kind of club membership that transforms their confidence once they join. Tables seem easy when you&apos;ve learned them, but the prospect of having to learn them drives fear into children - and this in turn has a negative effect on learning. And then there&apos;s "learning" and "mastering" - how well should they know them? In this article, I&apos;m going to look into learning times tables and provide some useful tips on how parents can help at home. This diagram shows the 144 times tables multiplication facts that every child needs commit to memory. Think of them like a daunting climbing wall - when you&apos;re a first-timer standing at the foot looking up it&apos;s scary - but once you start making a few hand and foot holds it gets much easier. One secret is choosing the right route - we&apos;ll deal with that later but first let&apos;s consider what we mean by "commit to memory" and "mastering." It&apos;s tempting to think that being able to answer the times tables and mastering them is the same thing. Unfortunately, they aren&apos;t.
Children need to be able to recall any times tables answer within two or three seconds - preferably in one second. That leaves no time for counting the way up to the answer from 2x, 3x, 4x etc - the answer has to pop out of memory pretty much instantly. It sounds harsh but this level of "number fluency" is the ideal foundation for any child - so how do we get there? What order should we learn times tables in? We, of course, start with the easy tables first - the Easy Times Tables are the 10x, 2x and 5x times tables. The 10x tables are a natural part of counting, the two times tables are familiar because of doubling, even numbers and they simply chant so well 2, 4, 6, 8, who do we appreciate. . . The 5x tables are helped by knowing the 10x tables and the fact that we have 5 fingers. There&apos;s some debate as to which are easiest from here but the 4x, 9x are usually next. The 4x tables are double the 2x tables and the 9x tables have a few shortcuts to help you learn them. After this you could the 3x tables followed by the 6x tables. Then the 8x tables and the 7x tables - which are generally regarded as difficult. The UK National curriculum has recently re-included the 11 and 12 multiplication tables many schools do them anyway - I think these should be learned last and separately - even though the 11s are a doddle! three times eight is . . .
three eights are . .
three lots of four are . . So just be aware that what makes sense to you might confuse your child. What are the methods for learning tables? 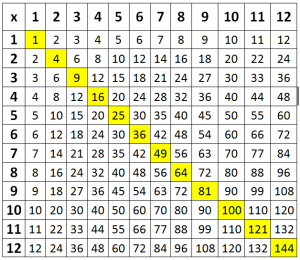 Each times table has a square number 3x3, 7x7 etc ( see the coloured numbers in the tables grid above ). These are special "hand or foot holds" that can act as memory hooks - emphasize them! When you&apos;re trying to speed up recalling tables introduce some games. Next week I&apos;ll suggest some fun games that you can play at home or in the car. The nine times tables can use the ten times tables and work back or compensate - so for 5 x 9, think ( 5 x 10 ) - 5 = 50 - 5 = 45, also note that the digits in the answer always add to 9. There&apos;s also a finger method which I&apos;m not a big fan of. 7x8=56 is the hardest times table! - but tell this to your child and make a big deal about it and they&apos;ll never forget it! You can know all the times tables without really going on to master them. So once your child has learned the times tables individually the next stage involves practising recalling them quickly in any random order. The practice can be verbal or written but either way you&apos;re looking for accurate answers in within 3 seconds. Mastering arithmetic is what Komodo is all about - it provides the an effective and rewarding way to help your child master numeracy or arithmetic at home. It makes sense to take stock of where your child is with tables before trying to help them. To do this we&apos;ve developed a unique new tables quiz that identifies exactly where to start. Kickstart not only identifies which tables your child knows but it will also guide you in which are truly mastered. How Well Does Your Child Know Times Tables? Take the Kickstart maths quiz to find out - it&apos;s free, fun and you&apos;ll get feedback sent privately.